Digitalize Your Business with CREDEMA Cloud Services! The Exhibitor's most Powerful Software Suite for Your Business to digitally manage Exhibition Marketing, Sales, Customer Service and Operations. ...the exhibition, promote your exhibit on your marketing channels! ...the exhibition, register and automate follow up communication! ...the exhibition, get smart on your leads and customers interest! Set up a competition to attract more interest and generate more fans to receive your news. Prepare a landing page with a registration form so people can provide their details. 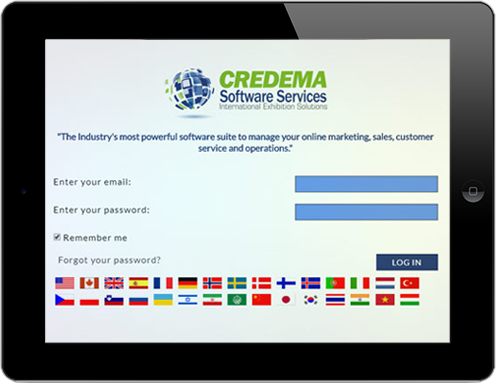 Scan business cards and import them directly into CREDEMA's CRM. Immediately view which contact has an account on LinkedIn and connect. Email Marketing at your fingertips to stay in touch and send immediate confirmation of contacts generated. Post updates of your booth on social media and set up workflows to offer more information to your contacts when they like or share. Use integrated SMS/MMS/Voice to advertise your special events or products during the show. See who is interacting with your online presence while at the show like Email reactions, web visitors or people signing up. 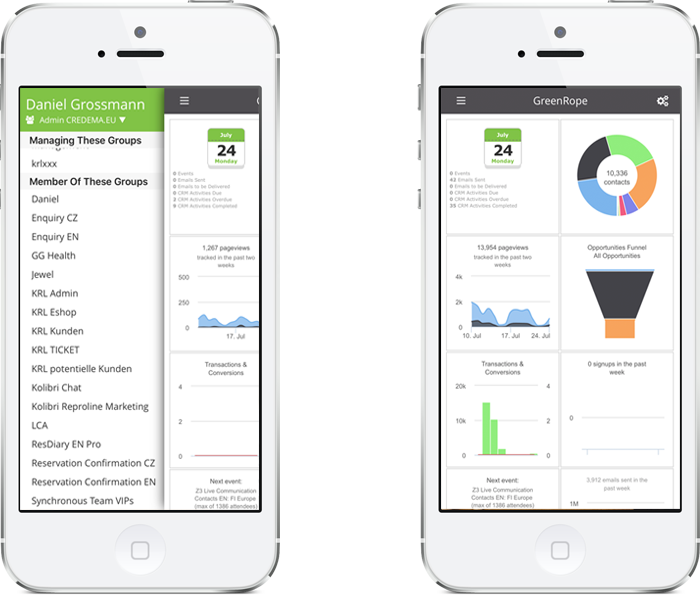 Monitor contact engagement and have all moves and actions added to the CRM profile. Big Data that's already structured provides past and real time analytics, so you can take the right decisions for the future. CREDEMA complies with the Swiss-US and EU-US Privacy Shield Framework. Emails, posts, etc. will only be sent to contacts listed in CREDEMA who have approved their willingness to be marketed to. Our technology is being developed in California and Europe to maintain the highest quality and legislative requirements. 5 Minutes of Video to understand CREDEMA benefits in action! To give you a brief insight into what CREDEMA.eu does, watch this short video to understand how your leads and customers can benefit from a solid state-of-the-art CRM, Marketing & Sales Automation solution. Our feature rich marketing and sales platform for exhibitors is cloud based and therefore is available to you everywhere you have internet access. Whether desktop, tablet or smartphone, manage your business anywhere! Are you a marketing software geek? Check out our free 30-day trial.